Vehicle allegedly driven by Jimmy Pearce II was involved in an apparent street race lost control and plowed into spectators in Johnston County Sunday night - 3 others are hurt. JOHNSTON COUNTY, N.C. (WTVD) -- A street race in Johnston County late Sunday night ended with four people dead and several injured. It happened around 11 p.m. on Simon Road and Buck Road in Middlesex. 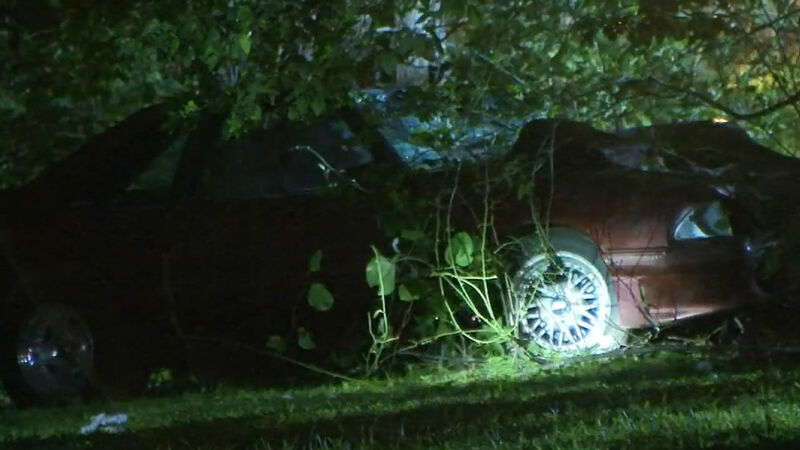 Witnesses told ABC11 that a crowd was gathered at the intersection to see a street race when a 1989 Ford Mustang lost control and struck the group. Four people were killed and three others were injured and taken to WakeMed Hospital. According to arrest warrants, the driver of the Mustang, 37-year-old Jimmy Pearce II of Zebulon, is charged with three counts of second-degree murder in the deaths of 42-year-old Carlton Ray Brooks, 39-year-old Garland Earp, and 40-year-old Undra Montrell Taybron. He's also charged with assault with a deadly weapon for allegedly injuring 44-year-old Roncellis Marshall and 43-year-old Larry Deans. More charges are pending. Troopers said the fourth man killed in the crash was 23-year-old Arrington Earp. Ida Mae Rapa, 42, who was also hit by the Mustang, was in critical condition at WakeMed. Pearce's sister said she learned of the crash Monday morning. "I knew my brother had a fast car, but he's never been in trouble. He never done anything like this," said Robin House. "Is he alright? How is he handling the fact someone died? And if he's going to be able to come home and be with his daughter and his wife." The driver in the other vehicle involved in the race fled the scene. Anyone that can provide information on the driver of the second vehicle is asked to call the State Highway Patrol at (800) 662-7956. Many of those who knew Garland Earp told ABC11 that he had an undeniable passion for fast cars. "He loved racing and his heart was racing," said Terry Faison. "He was a great guy though." One of Earp's friends, Ricky Lynch, said street races happen often in the area. "A lot of people come out and watch races, but most of them they usually do it during the day," said Lynch. "They don't usually race at night too much." Paola Reyes said friends invited her to come watch the street race Sunday night. "Anything can happen at any moment so I just prefer to stay home," she said. Knowing the devastating outcome, she's relieved she declined the invitation. "There's usually races around here a lot like maybe three times a month," she said. "Normally people that race over here is people that don't live around here." Residents say street racing is a common occurrence along Simon Road.